​ For roughly the last 35 years of her life, Elizabeth Ruthruff Wilson was a steady participant, friend and supporter of the arts in Tecumseh. Although born in Willis, Michigan, Elizabeth spent part of her childhood in Tecumseh before her parents Charles S. Ruthruff and Lulu Pulver Ruthruff moved to Jackson in 1908. There Elizabeth had her first violin lesson at 13. She graduated from high school in 1923 and spent a year each at Albion College and the Toledo Conservatory of Music. She had a lifelong love for music. While her career was not in music, her heart always was. Her career was spent working with Dr. Henry H. Kessler, founder of the Kessler Institute for Rehabilitation in West Orange, New Jersey. After she retired in 1968, she moved back to Tecumseh and shared a family home with her sister Dorothy. In retirement, Elizabeth finally had time to pursue her love of music full time both through her own participation and in her support of musical events and music education activities. 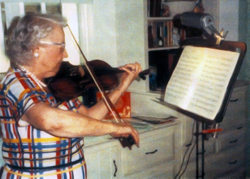 Elizabeth particularly believed in furthering the music education for local youth and taught violin lessons until well into her eighties. She was instrumental in the founding of the Tecumseh Pops Orchestra and the building of the Civic Auditorium and was involved with their boards of directors until her death. Always looking to the future, in 1997 (at age 92), Elizabeth established the Elizabeth Ruthruff Wilson Foundation, which is dedicated to supporting Music and the Performing Arts. Since her death in 2001 the Foundation has continued to carry out her wishes. It established the Elizabeth Ruthruff Wilson Foundation Scholarship for Excellence in Music and/or Performing Arts in 2002. This program targets graduates from Lenawee County high schools interested in pursuing a post-secondary degree in Music or Performing Arts. In 2003, the Foundation initiated the Elizabeth Ruthruff Wilson Camp Scholarship program to provide tuition support for Lenawee County children wishing to attend Music or Performing Arts summer camps. Elizabeth was a founding member and would be proud to see the group is still going strong!